I have been having trouble with dead spots on my OO layout, unfortunately some of them are in the tunnel. This meant quite a lot of work. I intend to clean the track with IPA solution including in the tunnel. Most of the track is accessible with some stretching but the only proper way to do the track in the tunnel is to open the back of the tunnel to give me full access. 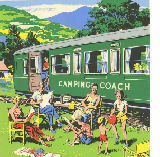 Camping coaches were first introduced in July 1933, when there was a great deal of popular enthusiasm for hiking and camping as holiday activities. The coaches were old passenger vehicles no longer suitable for use in trains, that had been converted to provide basic sleeping and living space at static locations, off the main line. I wanted to add a camping coach to my layout but realised that I didn't have a suitable place and that I would have to make a slight alteration to the layout, so, off we go again.